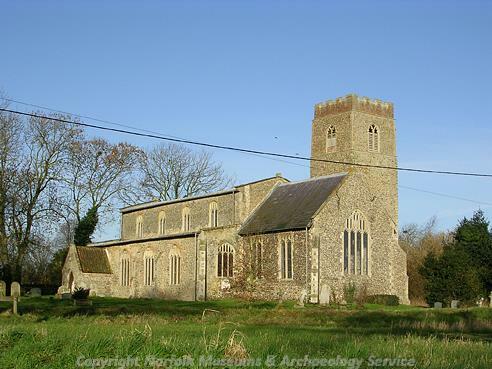 The parish of Guestwick is located in the district of Broadland, about 23km northwest of Norwich and 10km west of Aylsham. The modern village of Guestwick is situated in the centre of the parish, with the hamlet of Guestwick Green in the south. There are also a number of isolated farms. Archaeological work has been carried out in Guestwick parish. A series of excavations were conducted at St Peter’s Church in the 1980s, archaeologists have visited a number of locations and a few sites have been identified on aerial photographs. Metal detecting and fieldwalking have also taken place, although nearly all of this has occurred in the eastern half of the parish. It is important to note that nearly all of the sites in the parish are recorded to the east of the road from Guestwick Green to Foulsham and Hindolveston, with only three situated to the west. Only a few prehistoric artefacts have been found in the parish. They include a flint scraper found in a garden and possible prehistoric struck flints found in an excavation at St Peter’s Church (NHER 3131). Prehistoric burnt flints (pot boilers) have been discovered at two sites in the north of the parish. These objects may indicate the locations of two prehistoric burnt mounds. At a site reasonably close to the pot boiler sites two ring ditches and a double ring ditch (NHER 12800) have been identified on aerial photographs. These may be the remains of Bronze Age barrows. In the east of the parish metal detectorists have discovered Roman objects including pottery, fired clay and tiles (NHER 34913). The tiles suggest that there could have been a Roman building on the site. It is possible that the Roman tiles and bricks present in the late 11th century tower at St Peter’s Church came from this site. Roman objects have been found at six other sites in the northeastern quarter of the parish. They include pottery fragments, coins and a harness fitting. No Early or Middle Saxon finds are recorded in the parish. Late Saxon pottery has been found during excavations at St Peter’s Church (NHER 3131) and during fieldwalking to the northwest of it. The late 11th century church tower was originally situated in the centre of a late 11th century church. The nave and chancel apse of this building were demolished before the present church was built in the 14th and 15th centuries and were revealed during excavations in the 1980s. The tower now stands adjacent to the north aisle and chancel. An interesting feature inside the church is a 13th century wooden coffin slab that has been reused as a doorway lintel in the tower and north aisle. A contorted skeleton was also found during the excavations. The reason that the person died and how they came to be in such a strange position are both uncertain. Guestwick is called ‘Geghestueit’ in the Domesday Book of 1086. This is an Old English and Old Norse hybrid name meaning the ‘clearing belonging to Guist’. In 1086 there was a link between Guestwick and Guist. Although Hagni held some of the land at Guestwick, another section was held with land at Guist by the Bishop of Thetford as part of the manor of Hindolveston. Although the parish had a church in the late 11th century, it is not mentioned in the Domesday Book. Three medieval moated sites are recorded in the parish and all are located to the north of the village. Two survive in part as earthworks; Abbey Farm (NHER 3108) is located within one of them. The third (NHER 3113) has been identified from cropmarks identified on aerial photographs and flint and mortar foundations, pottery and metalwork have been discovered at the site. A fourth possible moated site is visible on aerial photographs of an area in the east of the parish. A number of undated enclosures and an undated field system have been noted on aerial photographs taken of the north and south of the parish. The features may be medieval or they may not. Part of a medieval wayside cross (NHER 13384) survives at Page's Farm. It is located alongside the road from Guestwick village to Wood Dalling. Medieval metal working debris has been found to the east of the church (NHER 21306). It is probably waste that was produced during the making of bells and it suggests that bell casting may have been carried out either on the site or in Guestwick village. Medieval and post medieval pottery and metalwork have been found at sites scattered throughout the centre and northeast of the parish. 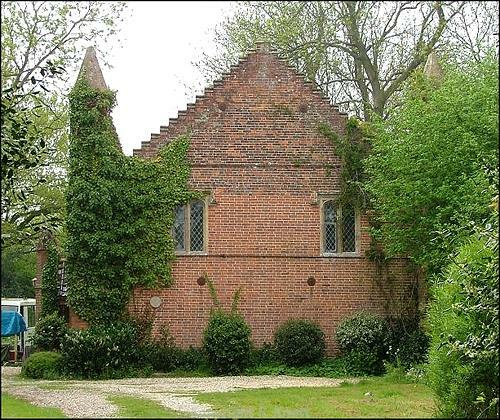 Guestwick Green is a late 17th century brick house situated in the hamlet of Guestwick Green. Abbey Farm (NHER 3108) and the Manse are 17th and 18th century houses. Old Hall Farm has a 17th and 18th century farmhouse and 18th and 19th century farm buildings. The Congregational Chapel (NHER 13124) was built in 1840 and probably includes features from a chapel that was built in 1652. In 1882 a railway line from Norwich to Cromer (NHER 13584) was opened. It passed through the centre of the parish and embankment earthworks survive north of Abbey Farm. David Robertson (NLA), 24 January 2006.